Queen Street (once called Lower Street - see 1812 map) runs from St. Johns Square to Waterloo Road. Bournes Bank and William Clowes Street run off one side and Clayhanger Street and Brickhouse Street run off the other. Queen Street gets its name from Queen Charlotte: A gift of a tea set to Queen Charlotte, consort of George III, produced a appointment of Wedgwood as Potter to Her Majesty in 1765. Wedgwood immediately named his range of cream coloured tableware Queen's Ware. Wedgwood instinctively knew the demand for the ware that graced the Queen's table would establish his already successful factory at the top of the market. 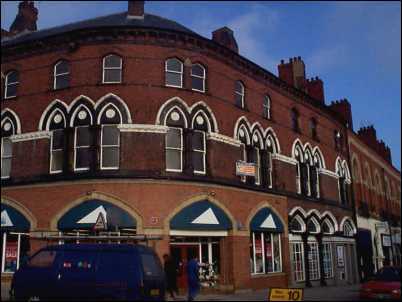 There are six listed buildings in Queen Street including four shop premises, the Wedgwood Institute and School of Art. 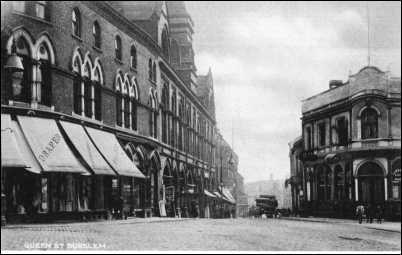 Looking directly down Queen Street with Hammersley's drapers on the left and the Star Hotel on the right. The Star Hotel was on the corner of Queen Street and Church Street (now William Clowes St.) which ran directly down to St. John's Church. The 1898 O/S map of Burslem shows a Public House at this location. The St. John's square end of Queens Street. The shop on the corner which is Bourne Sports, was previously Hammersley's drapery. On the right can be seen the beginning of the expansive indoor market, built in 1878 with an impressive frontage.